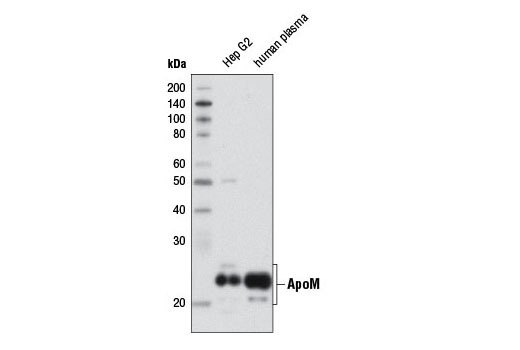 Western blot analysis of Hep G2 cell extracts and human plasma using ApoM (8F12) Mouse mAb. This protocol is intended for immunoprecipitation of native proteins for analysis by western immunoblot or kinase activity utilizing Protein G magnetic separation. Protein G Magnetic Beads: (#70024). A cell lysate pre-clearing step is highly recommended to reduce non-specific protein binding to the Protein G Magnetic beads. Pre-clear enough lysate for test samples and isotype controls. IMPORTANT: Appropriate isotype controls are highly recommended in order to show specific binding in your primary antibody immunoprecipitation. Use Normal Rabbit IgG #2729 for rabbit polyclonal primary antibodies, Rabbit (DA1E) mAb IgG XP® Isotype Control #3900 for rabbit monoclonal primary antibodies, and Mouse (G3A1) mAb IgG1 Isotype Control #5415 for mouse monoclonal primary antibodies. Isotype controls should be concentration matched and run alongside the primary antibody samples. Add primary antibody (at the appropriate dilution as recommended in the product datasheet) to 200 µl cell lysate. Incubate with rotation overnight at 4°C to form the immunocomplex. Load the sample (15-30 µl) on SDS-PAGE. NOTE: For proteins with molecular weights in the range of around 50 kDa, we recommend using Mouse Anti-Rabbit IgG (Light-Chain Specific) (D4W3E) mAb (#45262) or Mouse Anti-Rabbit IgG (Conformation Specific) (L27A9) mAb (#3678) (or HRP conjugate #5127) as a secondary antibody to minimize interference produced by denatured heavy chains. For proteins with molecular weights in the range of around 25 kDa, Mouse Anti-Rabbit IgG (Conformation Specific) (L27A9) mAb (#3678) (or HRP conjugate #5127) is recommended to minimize interference produced by denatured light chains. ApoM (8F12) Mouse mAb recognizes endogenous levels of both unglycosylated and glycosylated ApoM protein. Monoclonal antibody is produced by immunizing animals with a purified recombinant fragment of human ApoM protein. Apolipoproteins are plasma lipoproteins that function as transporters of lipids and cholesterol in the circulatory system. Chylomicrons are a fundamental class of apolipoproteins containing very low-density lipoproteins (VLDL), intermediate-density lipoproteins (IDL), low-density lipoproteins (LDL), and high-density lipoproteins (HDL) (1,2). Apolipoprotein M (ApoM) is a novel membrane bound apolipoprotein involved in lipid transport. ApoM primarily interacts with HDL and regulates its metabolism (3). It is highly expressed in hepatocytes and kidney proximal tubule cells. Recently, ApoM was shown to act as a vasculoprotective constituent of HDL by delivering S1P to the S1P receptor on endothelial cells (4). SNPs of ApoM have been associated with type 2 diabetes (5). Kwiterovich, P.O. (2000) Am J Cardiol 86, 5L-10L. Hussain, M.M. (2000) Atherosclerosis 148, 1-15. Xu, N. and Dahlbäck, B. (1999) J Biol Chem 274, 31286-90. Christoffersen, C. et al. (2011) Proc Natl Acad Sci U S A 108, 9613-8. Zhou, J.W. et al. (2011) PLoS One 6, e17324.